Nov., Yingkow, China: An unidentified Chinese troopship evacuating Nationalist troops from Manchuria sank near Yingkow, killing an estimated 6,000 persons. 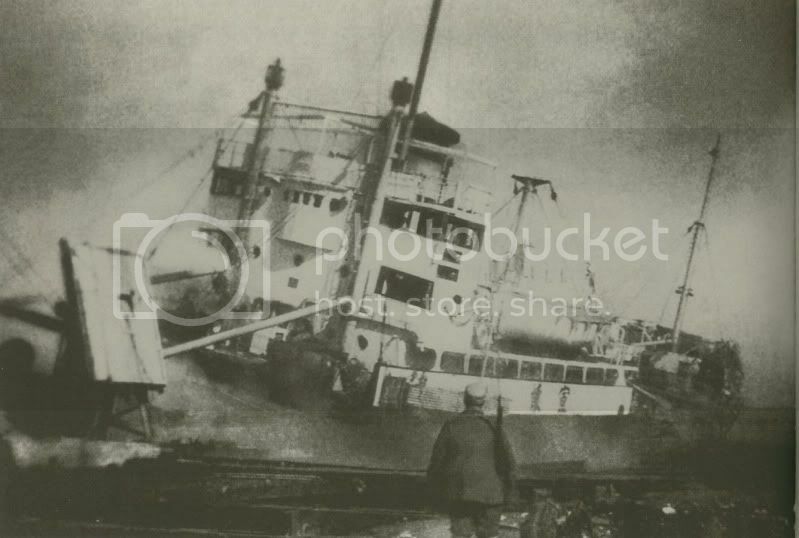 Dec. 3, Kiangya: Chinese passenger ship carrying refugees fleeing Communist troops sank off Shanghai; over 3,000 believed to have been killed. In Nov 1948, the Nationalist army in Chinese Northeastern provinces were collapsed, the 52nd Army Corps was the only unit left relative intact, and was isolated in the YingKou Port, the only way to save them was to evacuated them via sea, and in that process, a ship filled with troops and equipments caught fire, according to survivor's account, fire was caused by soldiers smoking under the deck, soldiers and sailors tried but failed to extinguish the fire, soon the fire was out of control and ammunition started to explored, there ware panic, many jumped overboard and drowned, other died of fire, according to the unit history of the 52nd Army Corps, 3000 officers and men were killed in this disaster. Are there any ship names available? 宣怀, pronounce as "Xuan Huai"
I believe this photo depicts the smoldering hulk of the MV Hsuan Huai, as indicated by the characters painted on the ship's gunwale, still moored to port, taken some time after PLA forces liberated Yingkou. Interestingly, the mainland Chinese secondary sources where I found this photo do not identify this ship at all. For instance, Volume 11, Liao-xi Da Hui Zhan ("The Liao-xi Campaign") of the series Guo Gong Sheng Si Da Jue Zhan ("Decisive Battles of the Chinese Civil War") includes this photo (p244) with the caption "Our forces smashed this enemy vessel during the advance on Yingkou." Any elaborations/details on this photo would be greatly appreciated. Last edited by Edward Chen on 02 Nov 2011 00:58, edited 1 time in total. Just wanted to add a little more information on this sad, nearly unknown tragedy exactly sixty-three years after the event, thanks to some information I came across. The China Merchants Steam Navigation Company cargo ship, MV Hsuan Huai (Xuan Huai Lun 宣懷輪), was the former Samuel S. Curwen (MC-2542). A coastal steamer of the N3-S-A2 design, displacing between 1,875 and 1,925 tons, she was one of fourteen of this particular design built by Avondale Marine Ways Inc. of Westwego, Louisiana (now Avondale Operations of Northrop Grumman Ship Systems). Completed in February 1945, a month later she was later sold to the British as Northern Master. Two years later she was one of 18 N3-type coastal steamers sold to the Republic of China’s CMSNC, named after Sheng Hsuan-huai (Sheng Xuanhuai 盛宣懷, 1844-1916), Minister of Transportation, head of the CMSNC and founder of Peiyang (now Tianjin) University during the last years of the Qing Dynasty. During the Liao-Shen Campaign (Sep 12–Nov 2, 1948), the first of the “Three Decisive Campaigns” that would end with the Chinese Communists taking over Manchuria and eliminating 475,000 Nationalist troops, the National Revolutionary Army’s (NRA) 52nd Corps (the 2nd and 25th Divisions) was deployed in the Anshan–Liaoyang region south of Shenyang, HQ of the NRA “Northeast Bandit Suppression Headquarters” (NE BSH) under General Wei Li-huang with some 250,000 men in the Shenyang region. Already regarded as one of the NRA’s crack formations for its combat record fighting the Japanese and Chinese Red Armies, at the time the corps was led by LTG Liu Yu-chang (劉玉章; 1903-1981), who had rose through the ranks of the 52nd and would become one of the NRA’s finest field commanders. The Liao-Shen Campaign began with the PLA Northeast Field Army under the brilliant future Marshal (and unsuccessful usurper) Lin Biao besieging and taking Jinzhou, to cut off the sole land supply route for the NRA in Manchuria. During the siege of Jinzhou, Chiang Kai-shek personally ordered a bold but unsuccessful two-pronged effort to relieve Jinzhou: one prong staged from the Jinxi-Huludao region by the so-called “Eastern Advance Army” (under Seventeenth Army C.O. Lt-Gen Hou Ching-ju) which was defeated by the PLA in their epic stand at Tashan (Oct 10-16, 1948); and the other prong from Shenyang by the so-called “Western Advance Army” (under Ninth Army C.O. Lt-Gen Liao Yao-hsiang, the former NRA New 6th Corps commander of Burma Campaign fame, which would include almost all of the NRA’s elite formations including the Burma-veteran New 1st and New 6th Corps), which was completely encircled and destroyed in the “Battle of the Liao’xi Corridor” (Oct 8-28, 1948). While LTG Liao’s Ninth Army was on the march to Jinzhou and its ultimate destruction, the NRA ordered Liu Yu-chang’s 52nd Corps to take the port of Yingkou on Liaodong Bay, then in PLA hands, to open up a withdrawal route through which the entire NE BSH could be evacuated if necessary. As Yingkou was only lightly defended, the NRA easily retook the port on October 24. Over the next three days, as the PLA encircled Liao’s Army and closed in on the main prize of Shenyang, the NE BSH C.O. Wei actually ordered Liu’s 52nd Corps to abandon Yingkou and head back north to reinforce Shenyang, but on the night of the 27th, when Liao’s Army was lost and the PLA enveloped Shenyang and took Anshan, Wei then ordered the 52nd Corps to hold Yingkou. Liu’s 52nd Corps went over to the defense on the 28th, but no other NRA forces would join him while elements of three NEFA columns (corps-sized PLA formations) bore down on the city, and the Nationalists arranged a sea evacuation using their naval forces based at Huludao. On October 31, as the PLA siege ring closed in on Yingkou, the 52nd Corps was prepared to ship out. At 0500 hours, Liu's corps HQ staff plus organic units and the NRA 25th Division left Yingkou on two other steamers, while the 2nd Division (numbering about six thousand men) was still loading aboard the MV Hsuan Huai when she unfortunately caught fire (My sources do not state how the fire started), exploded and burned by the pier. Those on the main deck and upper holds—the division’s 4th Regiment and part of the 6th Regiment—managed to abandon ship and reach shore, to be embarked on smaller vessels and evacuated out of Yingkou. Those in the lower holds—most of the 5th Regiment and the rest of the 6th Regiment, the division’s organic units and artillery battalion—were trapped by overcrowding in the stairwells and over two thousand men lost their lives. Elements of the 2nd Division’s 5th Regiment also comprised the rearguard holding Yingkou, and except for some of this rearguard that was evacuated by sea, they were captured when the PLA finally took the city on November 2. The 52nd Corps was first evacuated to Huludao, joining the 140,000 troops of the “Eastern Advance Army” massed there. In the wake of the Hsuan Huai disaster, the 2nd Division’s acting commander who was onsite, Yin Hsien-chia, went AWOL, subsequent whereabouts unknown (the Division’s actual commander P’ing Er-ming was also concurrent 52nd Corps deputy and not onsite when the fire occurred). The entire NRA force at Huludao was evacuated on November 8, and either shipped to Tianjin, or in the case of the 52nd Corps, to Shanghai. Later during the Shanghai Campaign (May 10-27, 1949), Liu’s 52nd Corps fought a valiant defensive action on the Yuepu – Liuhang line north of Shanghai, inflicting heavy losses on the PLA Tenth Army (estimated at eight thousand casualties) and prolonging the defense of the city for a week, before withdrawing into Shanghai in good order where they were evacuated to the nearby Zhoushan Islands and then Taiwan in August 1949. In October 1952, the 52nd Corps was redesignated the Republic of China Army 8th Corps, and later quietly disbanded with the downsizing of the ROC Army. Mainland Chinese sources often describe the NRA 52nd Corps as the sixth of Chiang's five premier formations (namely the 5th, 18th, 74th, New 1st and New 6th Corps)--powerful NRA formations that the PLA avoided engaging in battle whenever possible, then celebrated to the high heavens when they were destroyed outright. However unlike Chiang's "five premier formations," the 52nd survived the Chinese Civil War to be peacefully disbanded. Thank you all for these information. I know well about the accident in Shanghai, but I know nothing about the accident of Xuanhuai. I have seen the photo that Edward Chen posted several times, but all with the same caption. I assume that the Communist side know very little about this accident, as I have never read about it before. I will pay attention to materials about this in the future. A brief newsreel clip of the smoldering hulk of the MV Hsuan Huai can be found at the Youtube link below, between the 6:54 and 7:05 mark. Apparently taken by accompanying camera crew sometime after PLA forces took Yingkou on November 2, 1948. This video is from the Chinese-language documentary “Iron Horses and Frozen Rivers—The War of Liberation in Manchuria” (鐵馬冰河--東北解放戰爭全紀錄), comprising ten half-hour-long episodes. Part of the excellent and comparatively-balanced “Phoenix TV Great Events” series produced by the Hong Kong-based Phoenix TV broadcast network, although the events depicted are typically pro-PRC.